Spotted at The Angler’s Rest in Castleknock, Dublin 20. 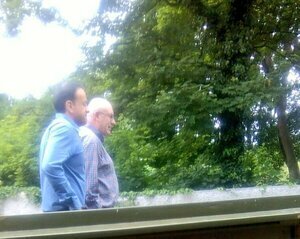 Fine Gael’s new leader and Taoiseach-elect Leo Varadkar walking with EU Commissioner for Agriculture and Rural Development and former Fine Gael Environment Minister Phil Hogan. 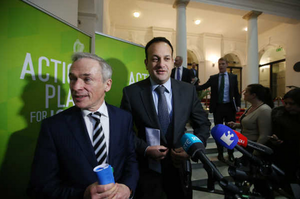 Posted in Misc and tagged Leo Varadkar, Phil Hogan at 3:06 pm on June 6, 2017 by Broadsheet. That is manifestly NOT Phil Hogan. What are you on about? Looks more like Austin Currie. Phil Hogan is a lot bigger. And rounder at the top. A really gorgeous spot, imo. Me oul stomping ground. The Anglers Rest = only known as D’anglers. ..if you ever loved me leo, love me now.. I was wondering when Strawberry Beds became part of Castleknock. I was wondering when Castleknock became part of the southside…. That made my day, Tony! Busybody taking sly pictures and then getting the names wrong. two men on a date what’s wrong with that. “Who is Leo boys and girls? He’s the gay son of an immigrant Múinteoir. Someone should check donation sources throughout Leo’s career. Clear case here he was groomed by hogan. Be cool if you meant Hulk Hogan. Bodger’s supreme journalistic skills strike again. JAYUS is the no end to castleknock it’s now in D20. by the by the anglers is in strawberry beds.